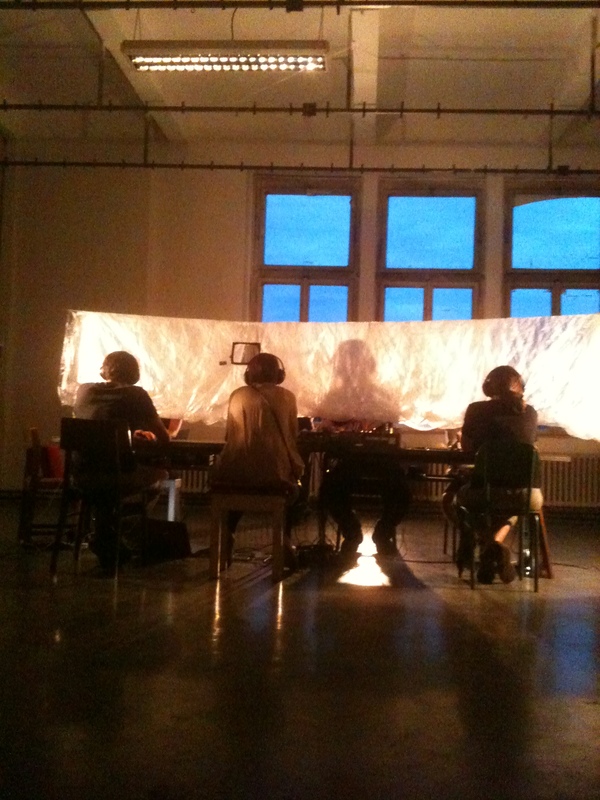 Audiowitness is an installation where visitors can hear the description of a performance through headphones and simultaneously witness a live action. There is one performer for each member of the audience, they share 8 min. 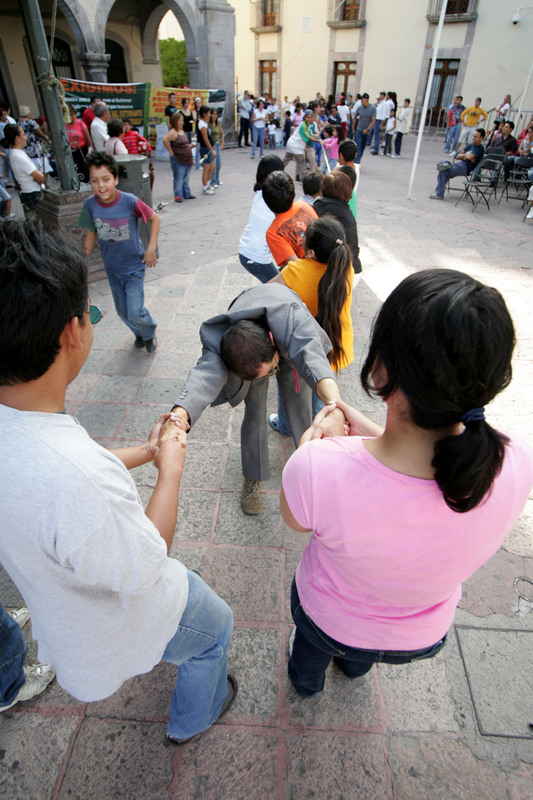 together in intensive communication through sound and action although they can´t never see each others face. After 8 Min. the sound and action stops, and visitors change chairs how they please to listen to the next narration of a performance. Guest artists: Rocío Zúñiga, Jenni Kokkomaki, Sodja Lotker, Howard Lotker, Katerina Housková, Petr Skala, Sol Rezza, Olivia Pills, Veronika Svabova, Tomas Procházka. 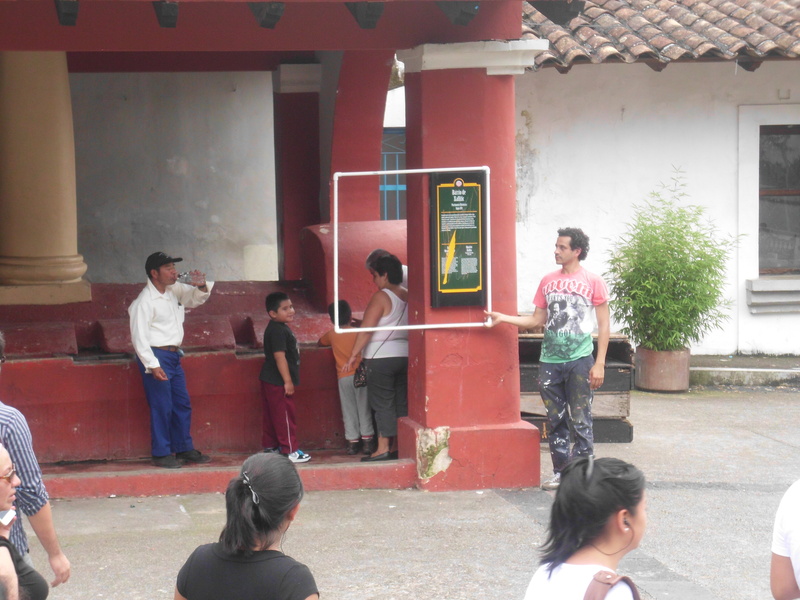 Soundwalk designed for the Plaza Xallitic in Xalapa, Mexico. Audience downloaded the mp3 and arrived at the performance with ther own ipods, phones, mp3. Four local persons where interviewed for creating the audio which displayed personal memories, historical facts and communal experiences. Through the walk dancers of Nandehui Art School interacted with the space and people in the park with surrealist actions. Piece created for the Danzaextrema Festival 2012. Sound design Tomas Prochazka. Project sent to HYPERALLERGIC Mail art Exhibition. Text and pictures by Kate Wadkins, Hyperallergic HQ. Brooklyn. 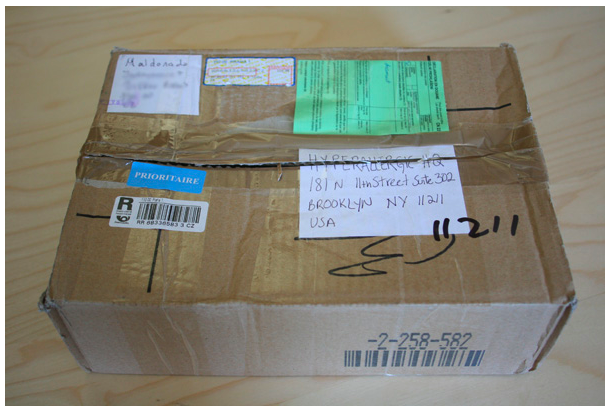 A suspicious package came to us from the Czech Republic, so I figured if I saw something, I should say something. 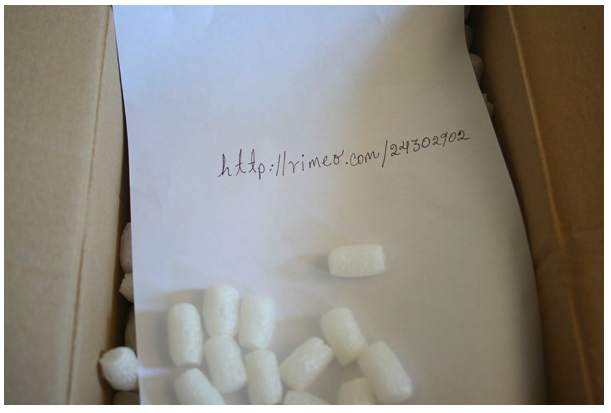 Hrag opened the box and said, “It’s just this, a piece of paper and peanuts… well, packing peanuts.” Upon further inspection, the paper had a URL written on it in ballpoint pen. I deduced that I was in for a video, but did not know what else to expect. Cristina Maldonado, a Mexican choreographer living in Prague and working with Czech artists, created a performance piece through the post. Maldonado’s performance began by her making a parcel for us and filming the process.This continued through the box’s journey through vehicles and across the sea, until our opening it at Hyperallergic. The final stage was my watching Maldonado’s video of the package’s creation. 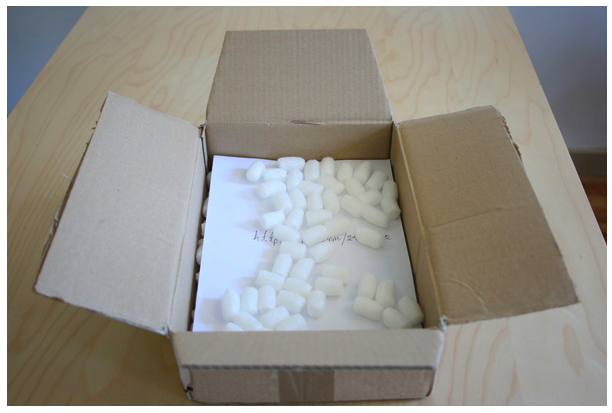 Maldonado’s performance really taps into the temporal qualities of mail art, combined with the more immediate and accessible qualities of internet work. 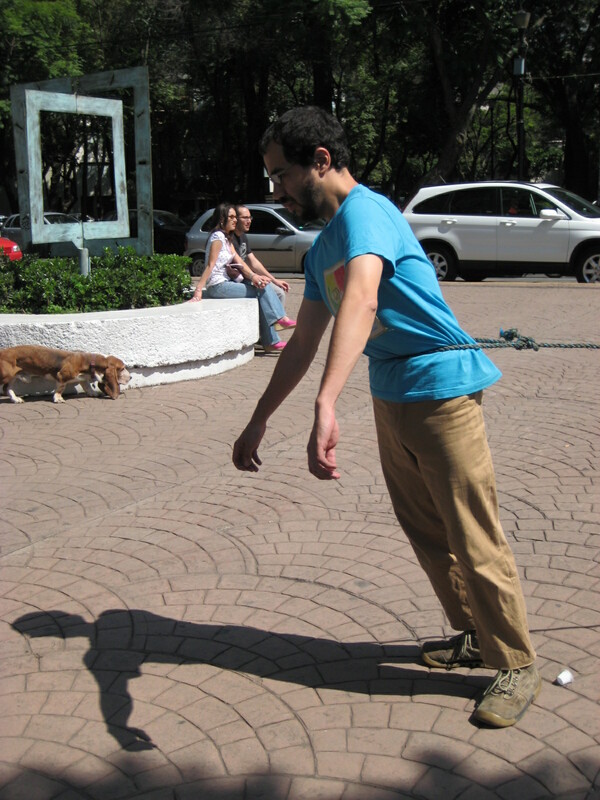 LINK Intervention of public/private space. A man and a woman are connected by a 15 m rope that is tied at their waste. Leaning opposite from each other they reach a fragile out of balance that remains stable as long as their intention to walk away from each other remains. 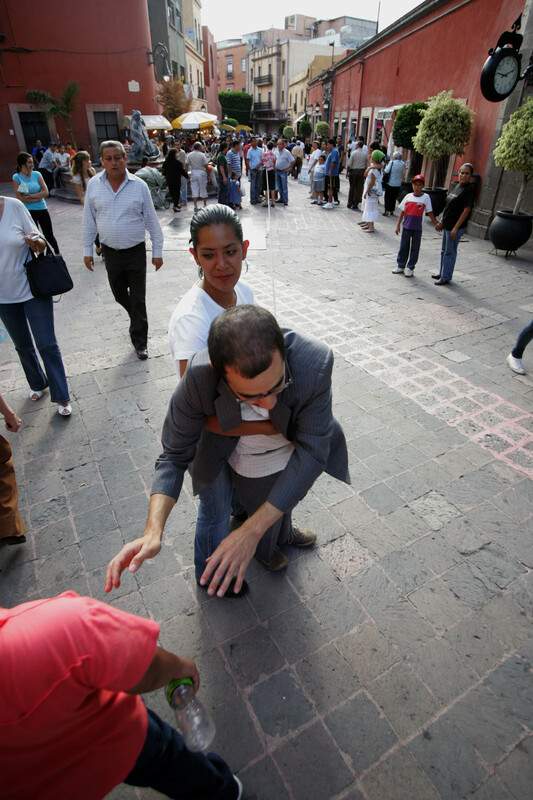 The action consits of simple movements and transitions in public space, and is completed by casual conversations with passerbys and direct involvement of people trying to help each one of them in different ways, pulling, advicing or speaking about their own experiences in relationships. Performed by Angelo Moroni and Cristina Maldonado. Site specific installation, filling the form performance. 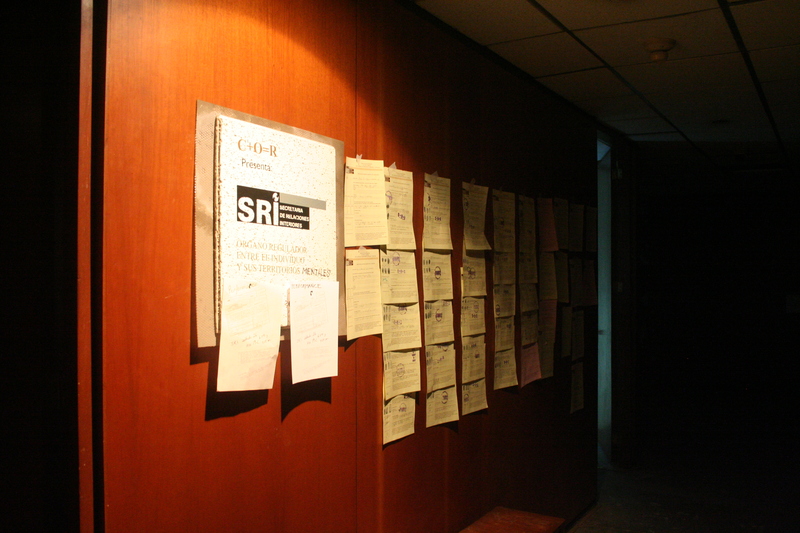 People went through a beurocratic process to register a lost ideal in the abandoned building of the former External Affairs Secretariat of Mexico that was built in the modern progressive 70´s. Antonio Salinas, Tania Solomonoff, Zuadd Atala, Angelo Moroni, Ignacio Velasco, Cristina Maldonado, Simon Steiner, Jorge Ramírez. 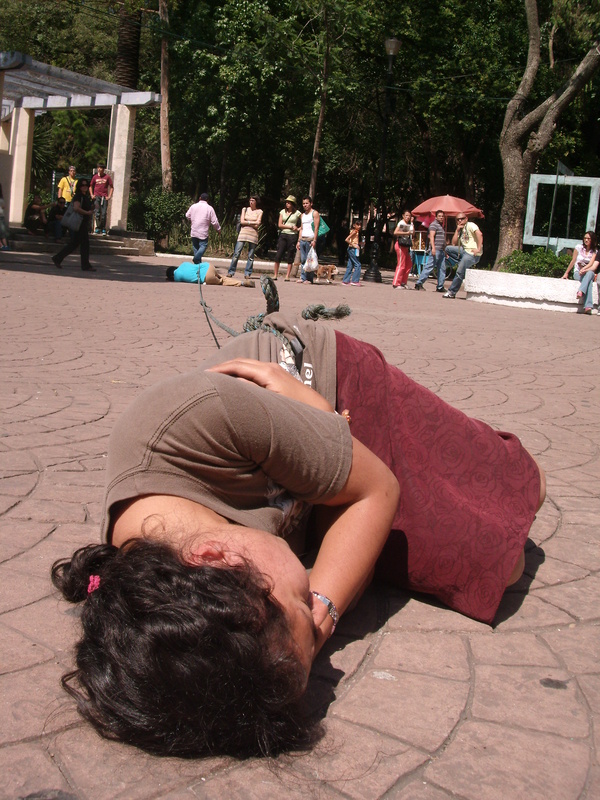 Esta obra fue diseñada para el encuentro internacional de arte contemporáneo ESTACIONARTE 2008. 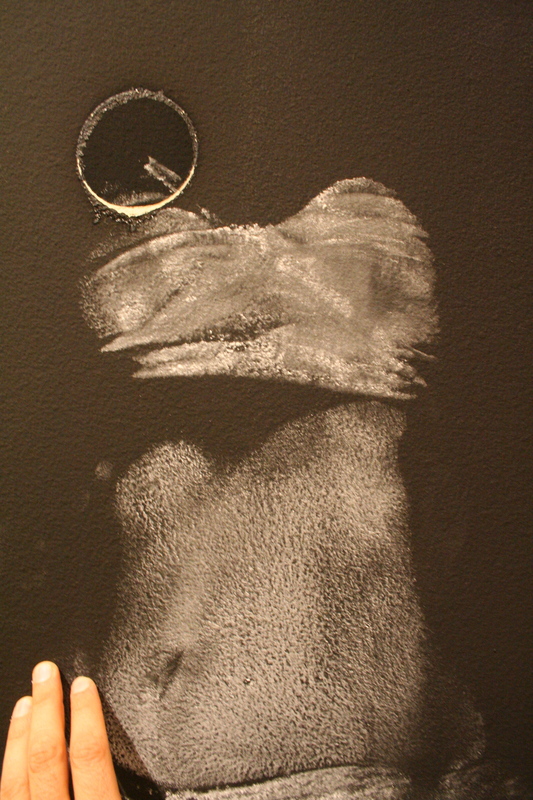 Imprint is an action that creates an installation. It´s photo-register was then designed and printed as a fotonovela to be read with an audio-fairy tale. Intimate encounter that leaves a track for others to see and feel. Perhaps the permanency of love is not achieved by staying together with someone, as we are taught to believe, but by letting the love that that person inspires in us, project into the world, there it will remain by marking and changing our immediate sorroundings.